DesignCheck has won the research and development category at the Australian Institute of Building (AIB) 2006 New South Wales Professional Excellence in Building Awards. Project team leader, Dr Lan Ding, from CSIRO, accepted the award on behalf of the whole Construction Innovation team in Sydney on Friday, 7 July. "Winning this award is a great honour for me personally and the entire team," said Dr Ding. The DesignCheck team are:Fanny Boulaire (CSIRO), Robin Drogemuller (CSIRO), Moshe Gilovitz (Building Commission), Prof. John Gero (USyd), Dr Julie Jupp (USyd), David Marchant (Woods Bagot), Dr John Mashford (CSIRO), Kevin McDonald (CSIRO), Cheryl McNamara (CSIRO), Lah Nemprempree (Woods Bagot), Wei Peng (USyd), Nicholas Preema (USyd), Dr Mike Rosenman (USyd) and Ji Soo Yoon (USyd). DesignCheck is a 3D CAD compatible software tool that reduces errors/rework and increases productivity by providing building designersand surveyors with an automated, quick and simple check against building codes. As the NSW Chapter winner, DesignCheck will joinProject Diagnostics (Qld Chapter winner) in competing for the national AIB award to be announced during its Construct 2006 conference on the Gold Coast from 28 to 30 September. Construction Innovation has created an introductory guide to eBusiness for small businesses in the building and construction industry. Produced by the eBusiness Adoption project team, 500 copies of the guide have been purchased by both the Master Builders Association (Victoria) and the Building Commission (Victoria) to distribute to members/clients. Project team leader, Kerry London, from The University of Newcastle, said the team examined informationabout eBusiness adoption in construction and other industries in Australia and internationally to bring this publication together. "While Australian businesses generally are well advanced compared with many other countries," said Assoc. Prof. London, "the construction industry is somewhat behind." 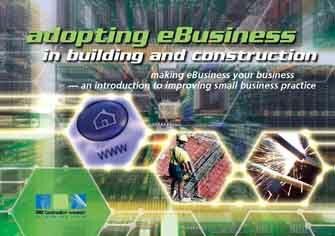 The guide aims to improve business practice by informing small building and construction companies about the benefits of adopting eBusiness technology. The eBusiness Adoption project is a Construction Innovation collaboration with John Holland, the Building Commission, Queensland Department of Main Roads, Queensland Department of Public Works, RMIT and The University of Newcastle. The guide is now available for purchase from our online store or electronic download.